Last September I had the amazing honor of going to Washington D.C. to be honored at the First Annual Bammy Awards as part of the BAM 100. They identified the most influential members of the "Twitterati" and honored 100 of us at the Bammy Award Ceremony on September 15th. It was such a special night and meant so much to be honored with the people who influence me every day. 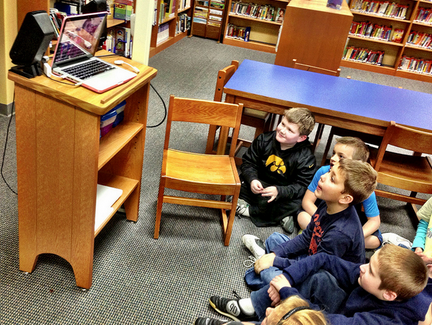 I took back the experience to my school in Van Meter, Iowa and shared the stories of others knowing this would also inspire my community too. 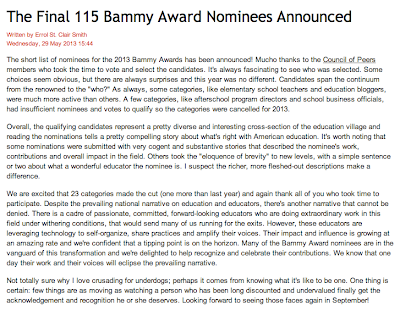 A few months ago Bam Radio Network opened up nominations for this years Bammy Awards. 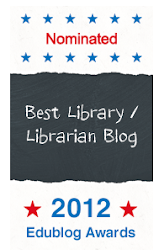 I was happy to receive an email that said I was nominated in the new category of "School Librarian". 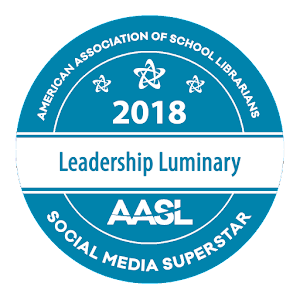 I was so moved and humbled to read the nominations from colleagues and friends from around the country and within my school, parents, and even one of my students. 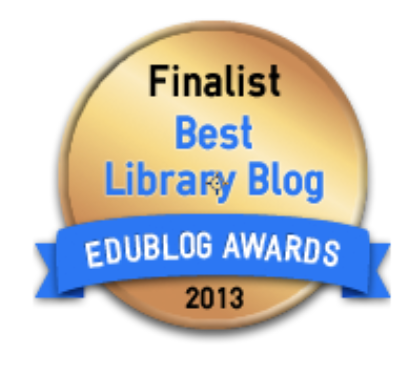 I am honored to be one of five finalists for the School Librarian Bammy Award. 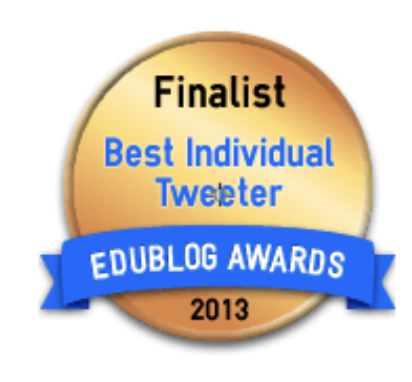 The other four finalists are all very dear friends of mine and amazing teacher librarians. To be included in this group is truly a honor. 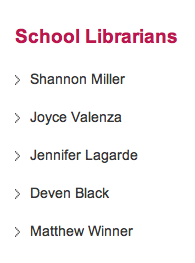 And to look at all of the teacher librarians who were nominated for Bammy Awards is amazing too. 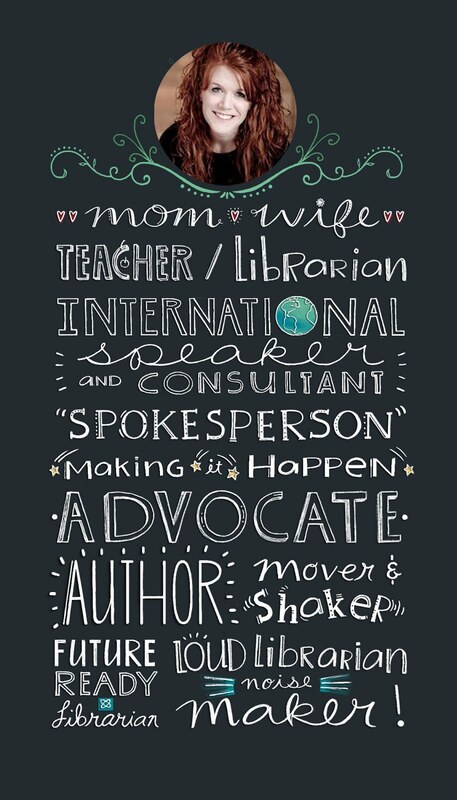 In our profession we have such incredible people surrounding us all the time. 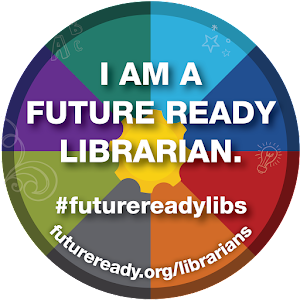 It is one of the best parts of being a teacher librarian....Our tribe is simply the best. 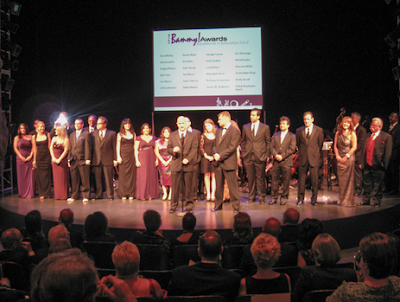 In September, the 2nd Annual Bammy Awards Ceremony will take place again in Washington D.C. 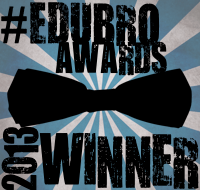 I look forward to spending time with all of the wonderful people at the awards. Thank you to everyone at Bam Radio Network for lifting up and saying thank you to all of the educators that make a difference in the lives of our young people each and every day. You Will Love These “Breakfast Serials” . 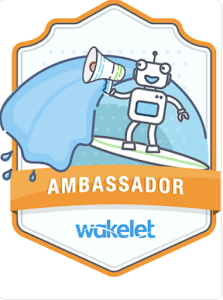 . . a place that blends literature and technology in exciting ways! I recently had the pleasure of meeting Linda Wright. She is the CEO and publisher of the amazing serial publishing and technology companies called Breakfast Serials and InstantSerials.com. When I was at the Patricia Polacco professional development author event at Mackin Educational Resources my friends Vicki and Steve Palmquist, two of the co-founders of Children's Literature Network, told me that I just had to meet Linda. They knew we would have a lot to talk about and that I would love Breakfast Serials. Linda and I met online one day and she told me all about Breakfast Serials and showed me around the website. 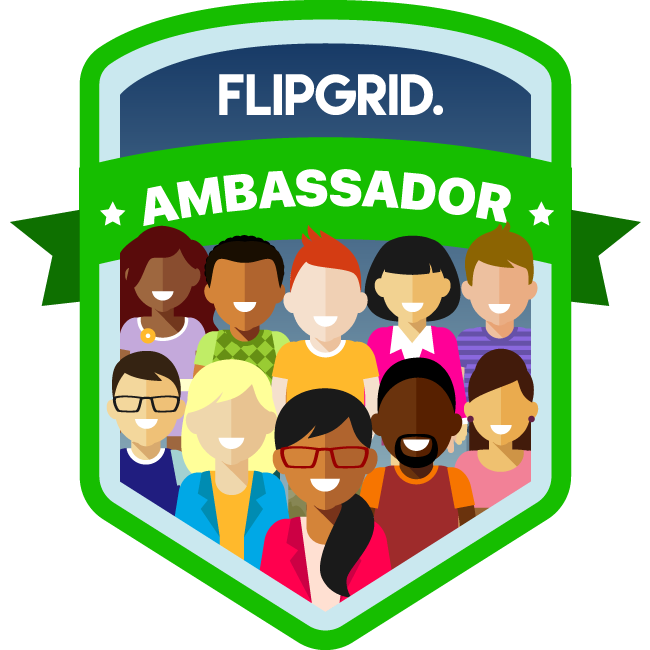 It was fascinating and a wonderful resource that every teacher should know about. 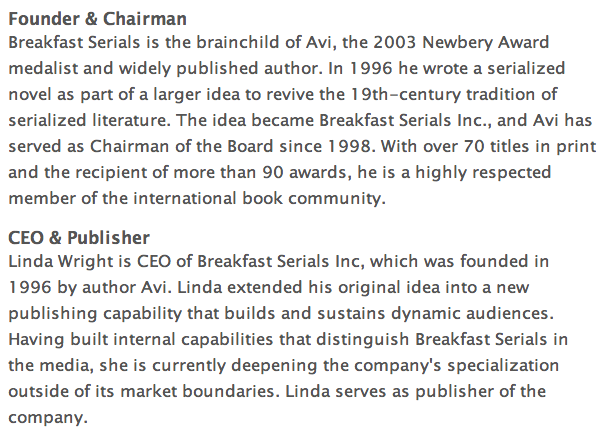 Linda first told me how Breakfast Serials came to be. 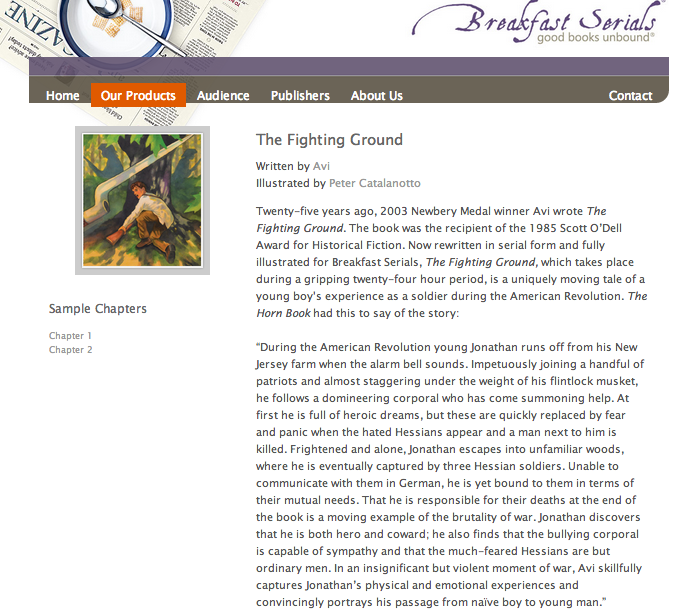 The Newbery Award medialist Avi wrote a serialized novel in 1996. 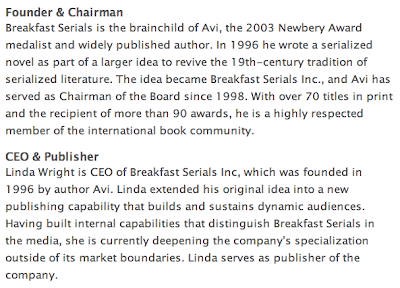 Linda then built on Avi's serialized novel to create this company and expand on his original idea. Instant Serials is an online publisher and technology platform that creates digital reading experiences with Breakfast Serials literature—stories told over a period of time in successive episodes. We’re online. On demand and always secure. 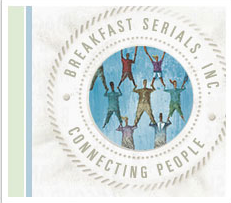 5 reasons to try Breakfast Serials in your classroom. 1. We lead the industry in serial publishing and serial delivery services. 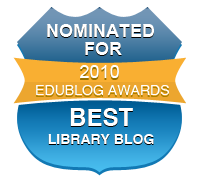 InstantSerials.com is an online InstantSerials.com was developed to innovate and foster independent reading in classrooms and living rooms. 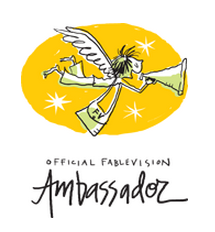 Our serials are dynamic creations by the best writers and illustrators. All created for a family audience. Before e-books and the Web truly existed, our serial titles were exclusively published in print newspapers around the world. 2. Our serials may be customized to your needs. Because we stream serial stories (rather than sell physical or electronic books) we’ve built a story format and delivery service to support independence. 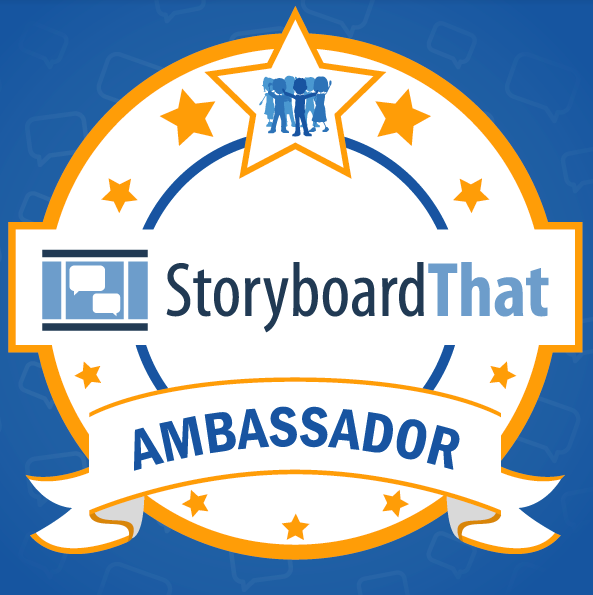 That means you can choose a title and schedule story episodes to fit your timetable. Readers can also design the look of each chapter as the art and text are dynamic. 3. 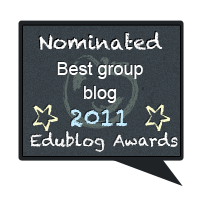 You can integrate reading groups in minutes, not days. We stream stories to reading groups one episode at a time. You schedule the release dates of each episode. The story unfolds at the same pace for everyone. No reader can jump ahead. Moreover, our software keeps track of each participant and reminds readers when new episodes will be released. While the reading group is sharing a story, Instant Serials’ platform serializes the group’s discussions. 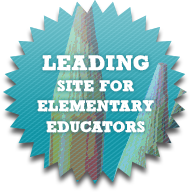 This way, your students get to share their thoughts and have their writing read by others as the story unfolds. 4. 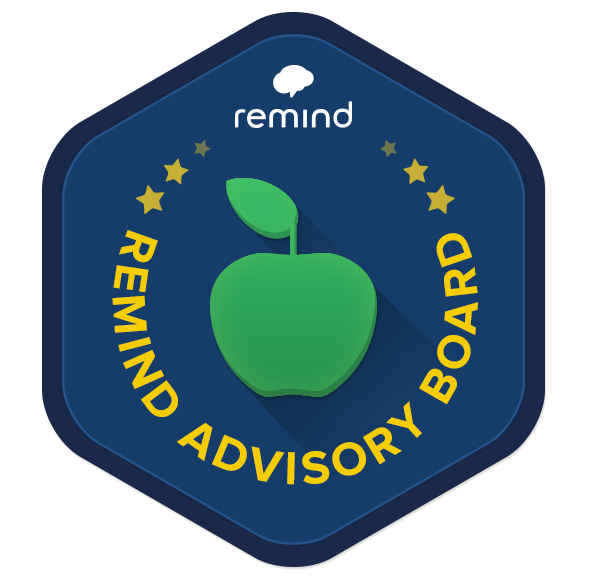 Robust management tools enable sophisticated control of reading group discussions by the teacher. Common Core Standard teacher’s guides have been created for each title. 5. We provide a solution that fits all budgets. - To preview our literature sign up for free. - Your account also entitles you to set up one free reading group (any size). 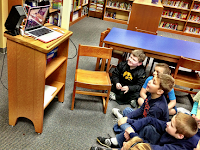 I enjoyed learning about Breakfast Serials and InstantSerials.com with Linda. 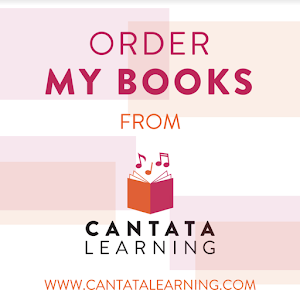 They are definitely something all students and teachers will love. Breakfast Serials just aren't read, they're consumed. You can go to the "Sample Chapters" too. As you can see, breakfast serials are another great place for all of us to check out this summer and share with our students and teachers in the fall. 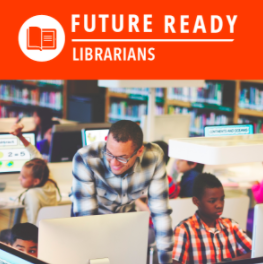 This is one place that will definitely get them excited about reading. Hagan and his friends at Van Meter got out of school on May 24th. One of Hagan's favorite things to do every day is to feed his sister Brianna's horse, Roman. He gives Roman carrots, apples, corn cobs and makes sure he has water every day. He always comes right over to Hagan to see what he has. One night I was talking to my friend Arturo Avina on Facebook. I was telling Art that we live in Madison County where The Bridges of Madison County was filmed. It is just a little different from where he lives in California. 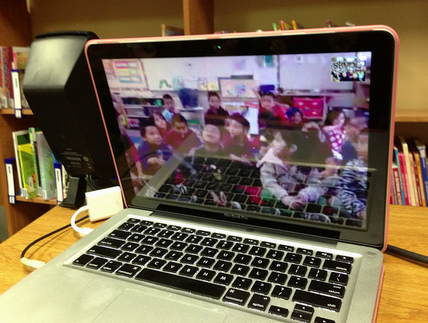 Since I have gotten to know his wonderful little kindergarten students over the last couple of months, Art and I thought it would be special to Skype with each other for a virtual field trip to our place out in the country. Art and his kindergarteners at Olympic Primary School in Los Angeles just got out of school yesterday so it worked out perfect since Hagan and I were home. We were excited that they were going to visit Roman and our place in Iowa. We used Skype to connect so I could use the Skype app on my iPhone. 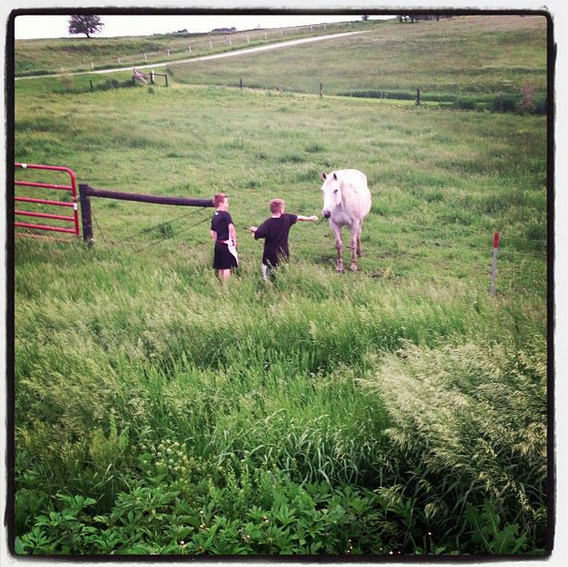 I loved seeing their little faces all ready to visit and see what we had to show them out in the country. We first showed them Roman and our dog Charlie. Hagan fed carrots to Roman and told them what else he liked to eat. Do you a cow? Do you have a pig? Do you ride your horse? Is there a farmer there? Do you have a crawfish? 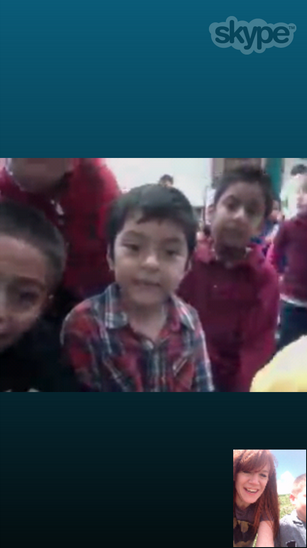 It was so much fun to talk to them about Iowa and the animals we have. I also told them about my dad Paul and brother Ryan. They are farmers in eastern Iowa and raise lots of crops and hogs. 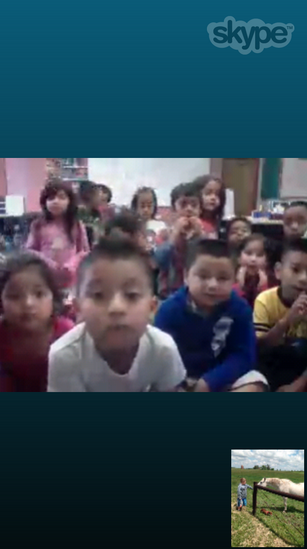 Next year I would love to Skype with Art's students from their farm or even from the field in a tractor. A real live farmer would be very special to bring to his classroom and students. 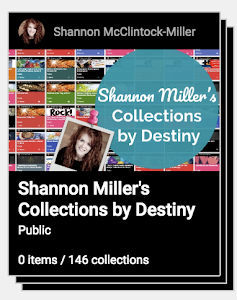 "Thank you Miss Shannon. We will miss you." That meant so much to me. To know that we are all important and special to each other even though we live over 1,000 miles apart and have never met in person. That is what all of this is all about. It just shows we can all make a difference by making these connections with others no matter where we are at. Art and I became friends on Twitter, our students connected, and this is just the beginning for all of us. Thank you friends.....You mean so much to me and you made such an impact on me this year. I will miss you too. 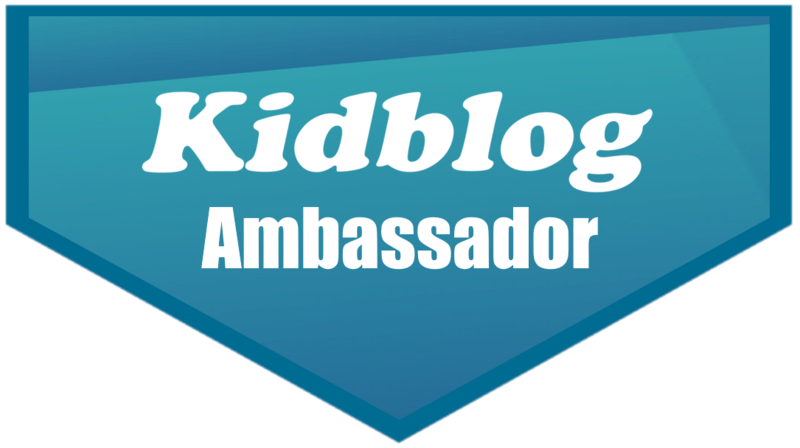 You can read all about our first connection in the post How One Amazing Movie Created By Our New Kindergarten Friends In LA Made A Difference At Our School. There's A MackinVIA eBook Reader App For That....and that, and that, and that! I always love it when School Library Journal comes in the mail. 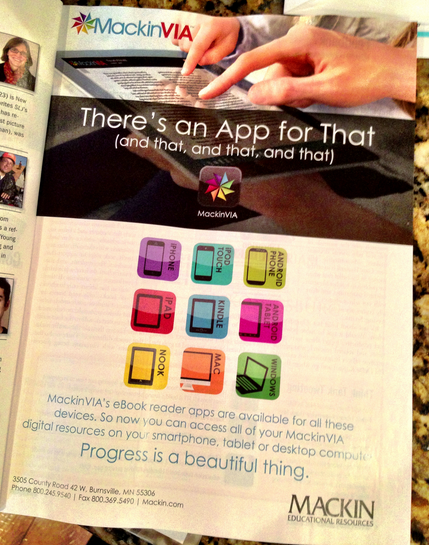 Today I was extra excited to open it up and find this new advertisement from Mackin Educational Resources for the MackinVIA Reader App. As it says...There's an app for that....and that, and that, and that! 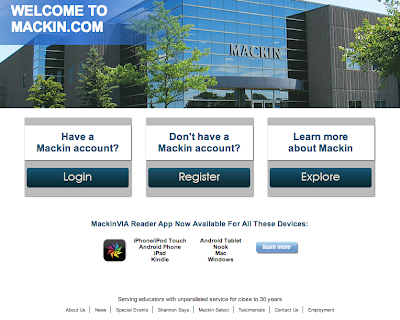 To learn more about the MackinVIA Reader App you can go to the bottom of the Mackin website. 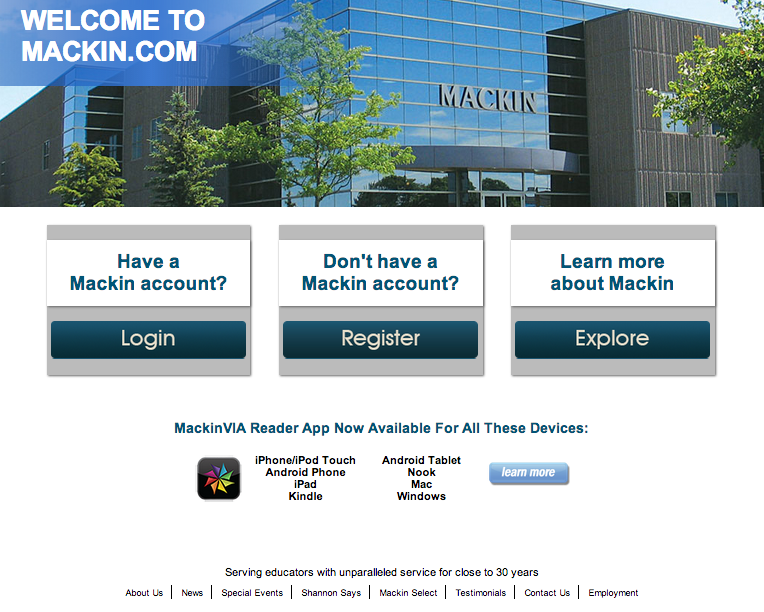 This will take you to the MackinVIA page and all of the information you will need to get started with the reader app on any device that you might have. 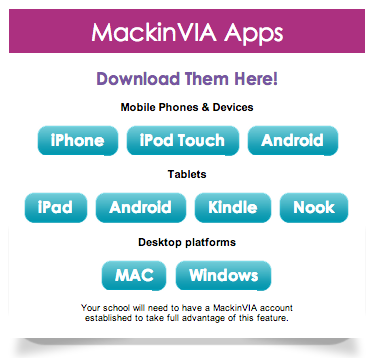 It is exciting to see the MackinVIA Reader App is available for so many different mobile phones & devices, tablets and desktop platforms. This makes it very easy for anyone to access the eBooks, databases and other digital resources we have within our MackinVIA. 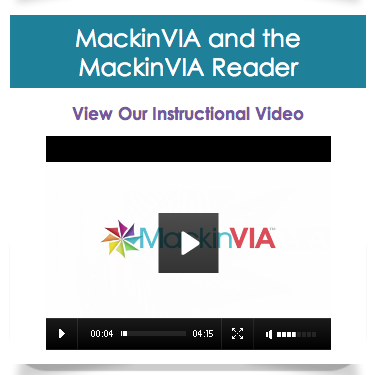 On this page there is also a wonderful instructional video for the MackinVIA Reader App which is a great introduction for students, teachers and parents. 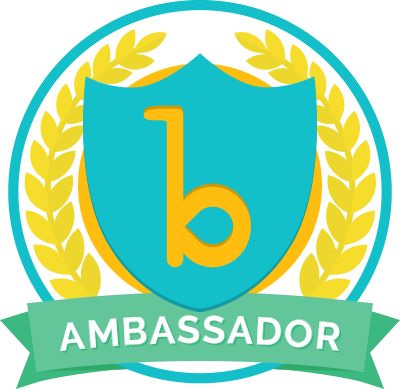 This is something I have shared with my school community and everyone really appreciates being able to learn and review what they need to know about using the MackinVIA Reader App. Tomorrow we are going on vacation so Hagan made sure we had the MackinVIA Reader App loaded onto our Nook and iPads....I love having it on my iPhone too. Last year during our Back-to-School Night we hosted a "MackinVIA Workshop" in the library for students and parents. 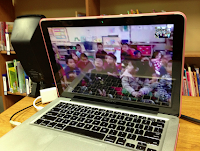 It was so much fun showing them how to access our digital library at home or anywhere they would like. This year it will be fun to feature all of the different ways they can read the digital resources too. A few more ways to read this summer. We always love that. The last few months my administrators, our computer and business teacher Eric Trudo, and myself have been talking about the subject of "Coding", computer programming, and the best way to integrate it into our school and curriculum. Earlier this week I found this video on Code.org. 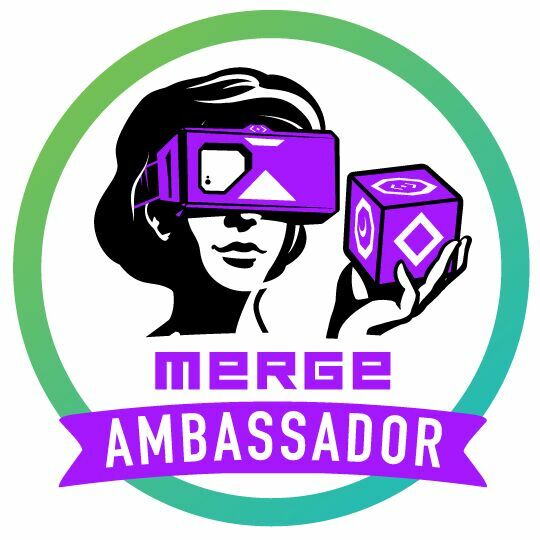 I just love the message and all of the individuals who speak to the importance of growing computer programming education. I have done a little with coding in the library. We have tried out Scratch, Code Academy and even worked at creating an app for our library and school. 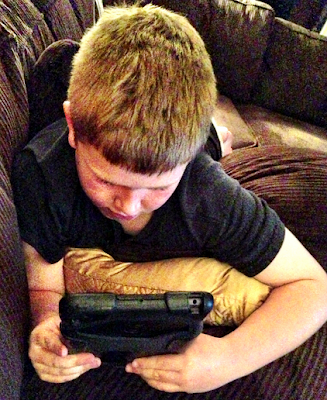 To tell you the truth, it is the kids who have figured these sites out even more than me. Our "Technical Difficulties Club" have also showed interest in learning to code when we talked about what they were curious and excited to learn. Where do we start? What do we include? Who can we connect with and include that will be helpful? How can our young people guide this as well? These questions and so many more will be an important focus for me this summer. 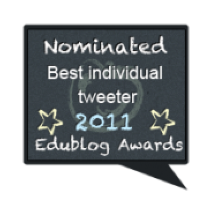 Today I asked my PLN on Twitter and Facebook for resources and tools. I read through blog posts about coding. I played around with websites like Hackety Hack and Alice. I even put a few coding apps on Hagan's iPad....Move the Turtle, TinyTap, and My DoodleGame were our favorites. 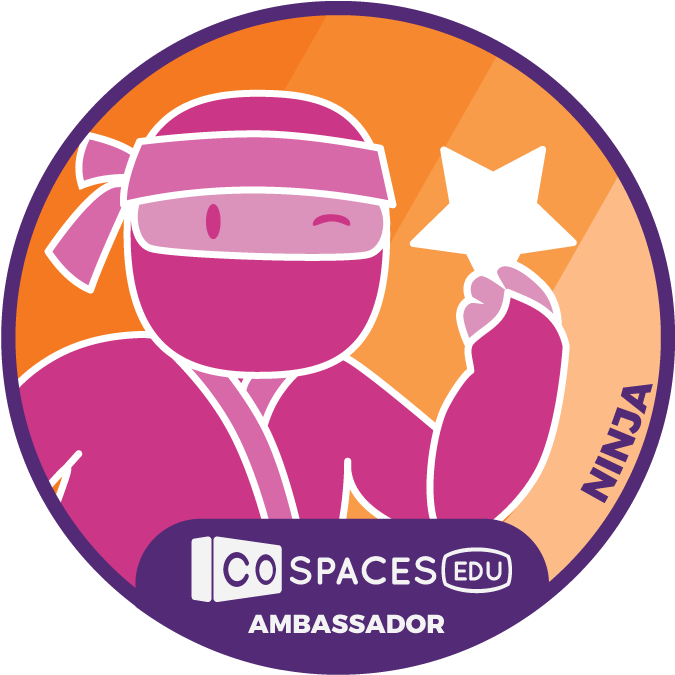 As I collected all of these resources and tools I added them to the new Symbaloo that I created called Coding, Coding, Coding Symbaloo. 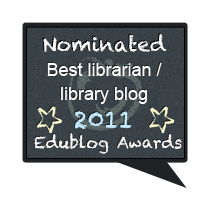 I added this to the Van Meter Library Symbaloo so everyone can find these easily. 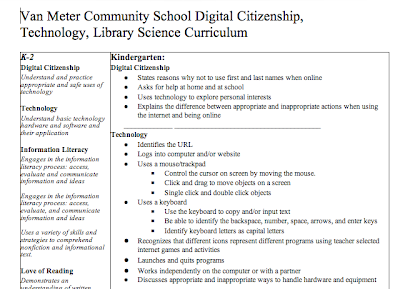 I also shared it on the Van Meter Voice Facebook page to encourage our students and families to check out the coding resources over the summer. This summer I want to learn how to use Tynker. 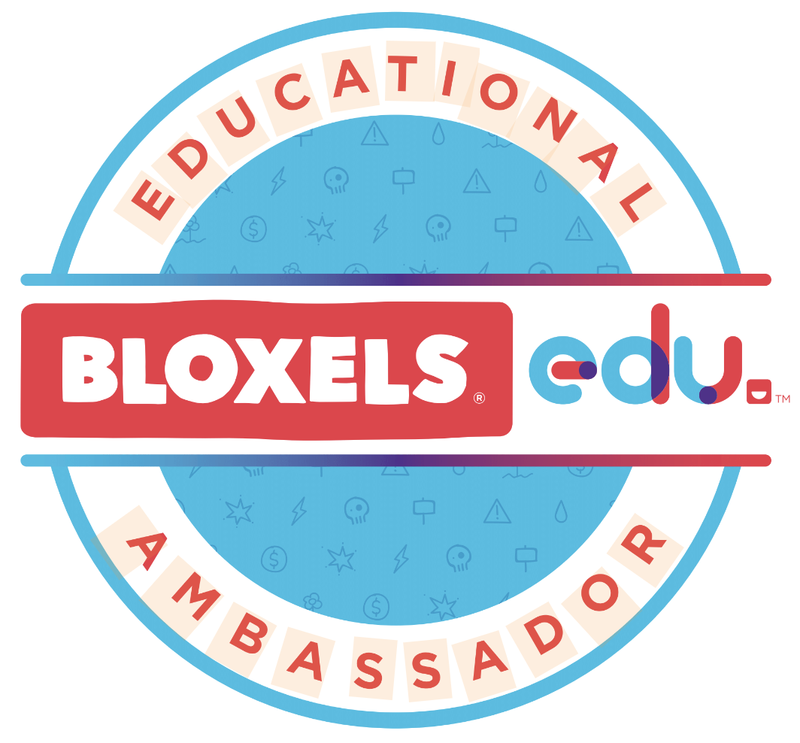 I loved reading their blog and reading about after-school coding clubs. The showcase of Miller Middle School is one example of the amazing things our young people can create using Tynker. 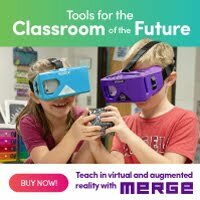 Hagan, my 8-year-old, and I are going to learn how to create some pretty awesome things too....We will be ready to teach everyone else in the fall. 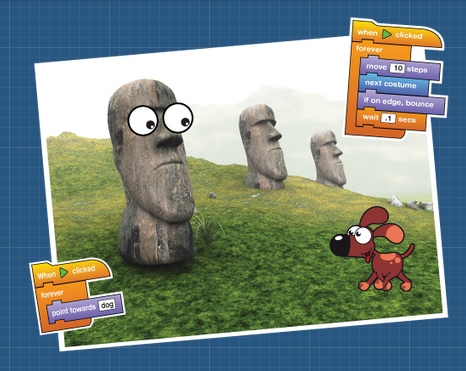 I also want to learn create an animation using Scratch and think of ways to integrate both into my curriculum. By learning all of these things and so much more I will be ready to work with Eric, our students and others to include computer programming within our curriculum. 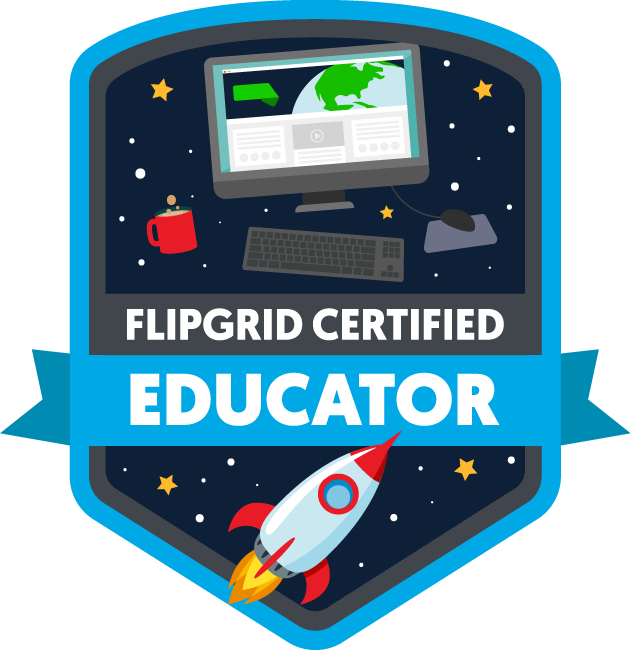 That is another thing I want to focus on....Are there any places that include specific coding standards yet? 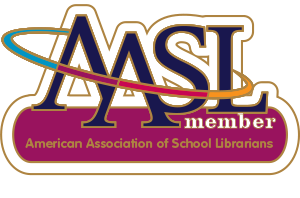 Will ISTE or AASL include anything soon? 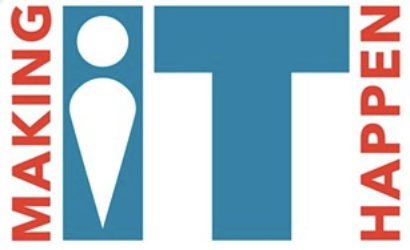 What about P21, the Partnership for 21st Century Skills? I have learned so much more over the last few months. This is a skill that is not an option, it is something we all must embrace and bring to our students. Coding is also one of those subjects that students will become excited, curious and passionate about. I can't wait to see what it will bring!